I've been considering this a couple years. I used to own Cannondale quads (Moto, Glamis), and dirtbikes (E440). The E440 rear shock was super long, and low profile because of clearance issues. It was a nice 3-way adjustable Ohlins. The length is close to ours, and the piggyback reservoir is offset to the side. I realize people have tried lots of shocks, but no one has tried EVERY shock, so I thought I would ask. I wish my friends still had their Dale dirtbikes around, I would test fit it. Update: i called Ohlins and they said Cannondale shocks are a bad choice because they use a twin piston PES design. Just wanted to throw that out there so no one makes a bad choice. Last edited by thedeatons; 09-14-2015 at 05:09 PM. 393mm long eye to eye, with 90mm of stroke without the bumper. Top eyelet is 10mm diameter; bottom is 12mm. 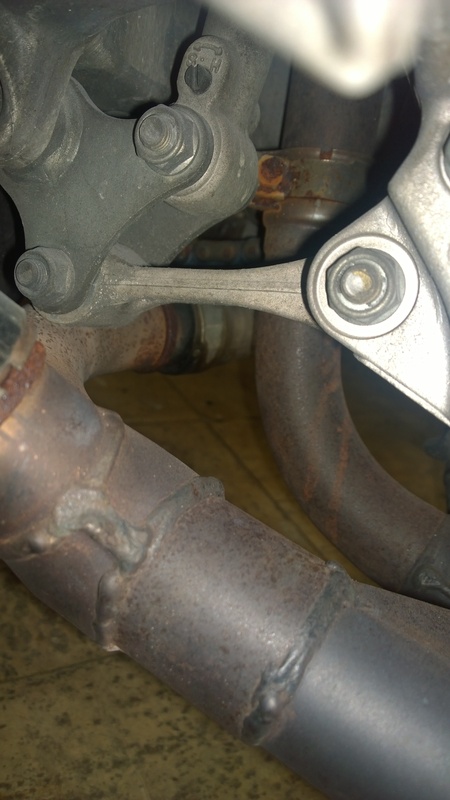 Just for reference the shock bush where it bolts into the bottom linkage is 39mm wide. As you mention "valving is different, and spring is probably the wrong rating" so even if you get it the same length it isn't a guarantee to work - also with the offset reservoir best check from the off that if fitted it isn't trying to share space with the VTR's rear header or interferes with the battery box. Last edited by Wicky; 07-25-2015 at 12:03 AM. 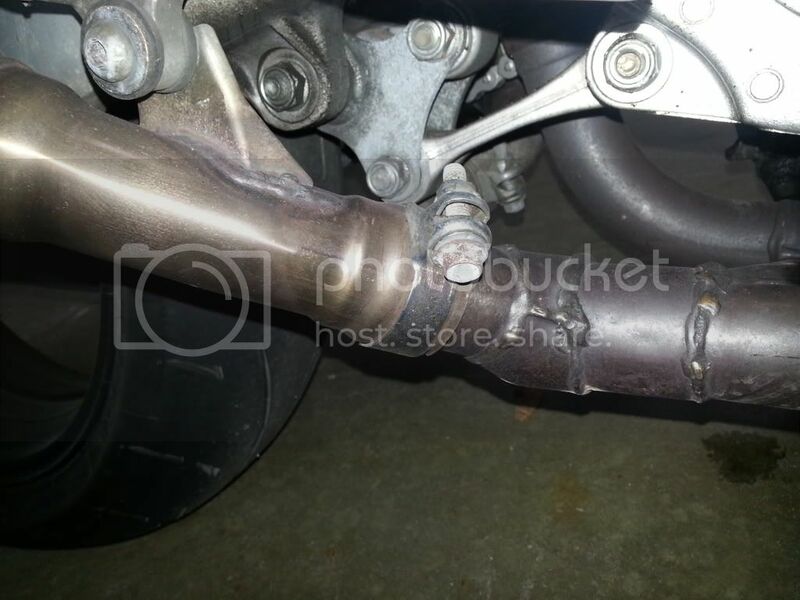 How was your gsxr shock modded to work? Do you know what needed to be changed? When I look up 87 gsxr shocks they look very short. What is the part number for your ohlins? 1) the Cannondale Ohlins piggyback reservoir is offset to the right (non-kickstand side). If it were offset to the left (kickstand side) it would have a lot more room to work with. 2) the battery box is just in the way quite a bit. It appears that if someone were using a smaller battery and deleted the battery box, then there would be lots of room for a piggyback shock. Last edited by thedeatons; 07-25-2015 at 07:31 AM. I think with the Cannondale shock the biggest issue will be length. The stock VTR is 346 and with a 6mm spacer that would be 352, so the Cannondale will be 41mm too long. Given the linkage ratio, your bike will be sitting really high at the back with that. Beyond that however I can't see any reason why any rebuildable shock could not be made to work, springs are easy enough to swap, and pistons can be re-shimmed if needed. Plus shocks can be shortened on the inside. They do it on super singles (supermonos) all the time. Over on another site that shall remain anonymous a guy has just fitted a 99 R1 piggy back shock with a modded ZX9 top mount to his VTR. It's an interesting concept and has caused some debate. Worth a look see, I have been watching the debate and am waiting on some more feedback. Questions about spring spec, bottoming out and static sag have been asked so far. The guy says that it is a big improvement over his standard setup. Just thought that it was worth a mention. This should fix that cough James! That link has got me thinking. There must be some alternative shocks out there apart from the overpriced big name units that will work in our bikes. The use of a different top mount is a great idea. Just need some others to try it out as well. I don't profess to know a lot about shocks and am reasonably happy with my current setup , however a cost effective improvement would be a welcome addition to my bike. This is a DMr exclusive and one of our most popular items! 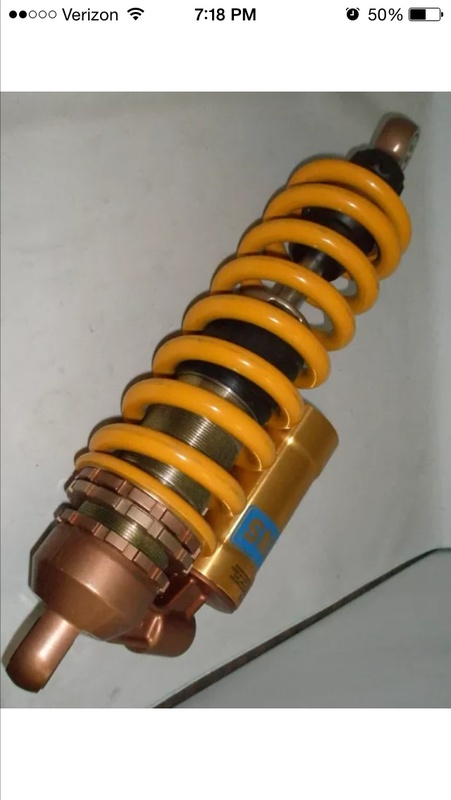 This conversion takes a standard CBR600F4 or CBR600F4i shock absorber and converts it so that it is a direct replacement for the stock VTR shock. 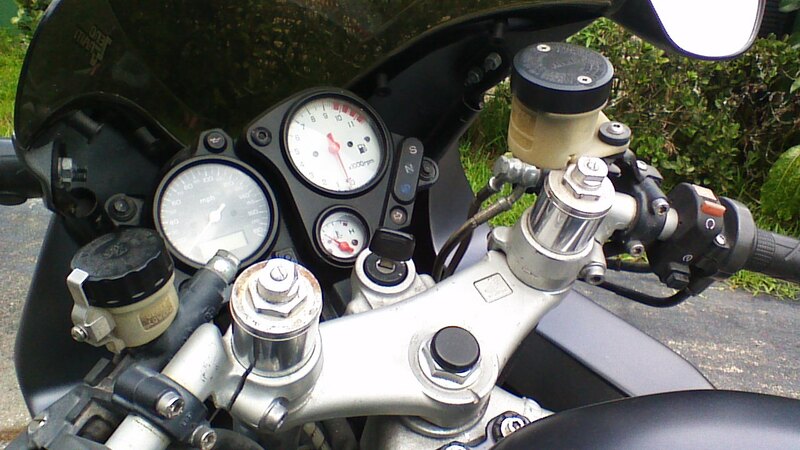 The shock would also have a new spring installed that is tuned to the rider's weight and type of riding. The revalving service replaces the piston with a DMr high flow version and custom tailored shim stacks for the best performance possible. 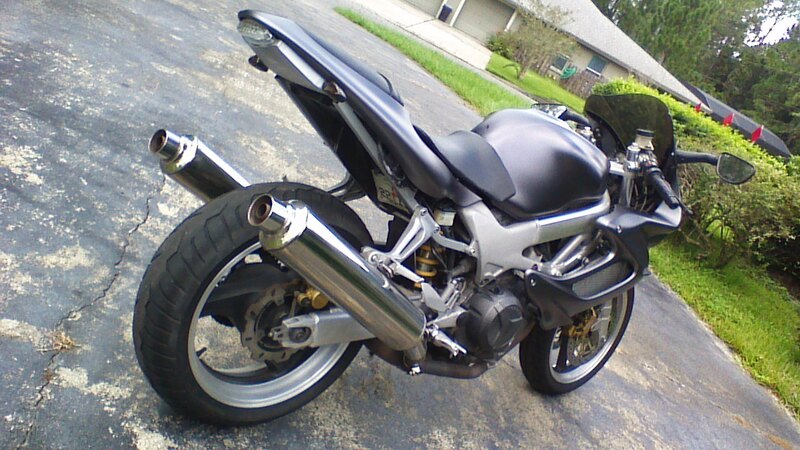 Price includes the donor CBR shock so nothing would need to be provided by the customer. I am aware of Jamie's conversion however being in OZ it would be more cost effective for me to buy a Hagon or similar. I like the idea of going to a wreckers and getting a donor shock from an R1 and using the Kwacka top mount to maybe get an improvement for a minimal outlay. No offence , but $ are important to me. I have 3 bikes to maintain and expenditure is measured by return on investment. If I only had 1 bike it wouldn't be a problem and I would buy an Ohlins and be done with it. Kudos to the guy for trying something outside the box and inspiring me to do the same. What do you think? and sorry for intruding on your post, but I thought that you may be interested in this take on a shock upgrade for our VTRs. Yep, I know about Jamie's shock, i've read all the posts about it. I'm in a similar boat about the CBR shock, plus I just don't care for that shock. No offense to Jamie, my mind has just gone in a different direction. I love the idea of simply getting a newer shock to fit, but I will not trim the battery box, plus I have the CBR900RR swingarm brace, which complicates space requirements even further. I really enjoy "the hunt". Researching other forums, checking out other shocks, measuring, etc. I refuse to accept the idea that there is only one "used" option available. No one has tried everything, which is what this post was about. We really live in a great time, because we have SOOOO many parts available to us from so many amazing bikes. 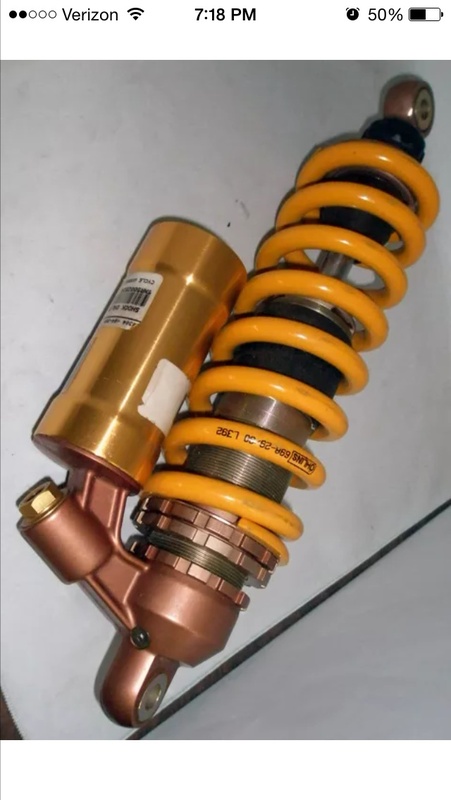 So overall, if someone wanted to upgrade their current stock rear shock without having to do any mods, what shock or shocks are available? My 2k Superhawk seems to sit a little low in the rear and the front has been lowered by the previous owner as you can tell in the pics. I'm just wanting to go back to stock ride height with performance riding in mind. Areola, have a look at the dog bone. I posted a picture showing what the stock one looks like. Granted, it's not the best picture, but you can still see it. I am curious how the previous owner lowered your bike. Some have used a "lowering link" purchased off eBay. It pretty much looks like a bolt. If you have this adjustable dog bone, you can raise your bike back up. I helped out a fellow member some time back with this exact problem. Center of one bolt to the center of the other, the length is 4.5". This will make your bike stock height again. If you don't have an adjustable dog bone, I am curious how they lowered it. Take a look and let us know what's down there. You could also check the shock's preload. 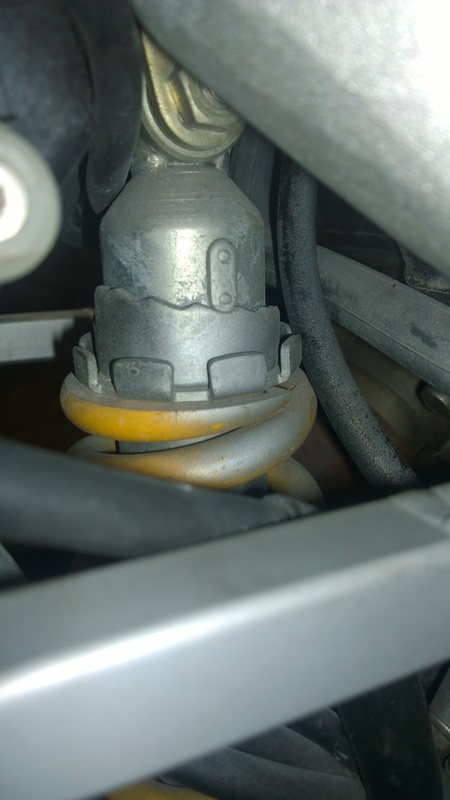 Perhaps someone ran the preload collars all the way up, thereby letting the shock sag more. I was just now able to zoom in on the second picture and it looks like you have the stock dog bone. Areola, maybe check the preload like James mentions. However, it sure looks a lot lower than what the preload can do. Maybe look at the top shock mount and also the...shoot, what's the name for it, ...the triangle piece that the shock, dog bone and swingarm are attached to. Maybe it was fabricated for some reason? Just throwing out ideas. You can place a shim between the top of the rear shock and frame. 3/16 " will raise the rear end alot. Make sure you have room between the pipe and chain. Yjo also need to raise the back end off the ground. Yes indeed it is. IMO the VTR spring is already over pre-loaded so I would not be adding any more preload unless the shock is bottoming out. I ran mine on the lowest setting (I'm 190 pounds). You should be able to buy a shock adjusting spanner on ebay, bad people use a hammer and a punch. The original tool kit has a shock adjuster if you have it. A bit of CRC or similar sprayed on the adjusting collar helps it turn a little easier but it is pretty hard. 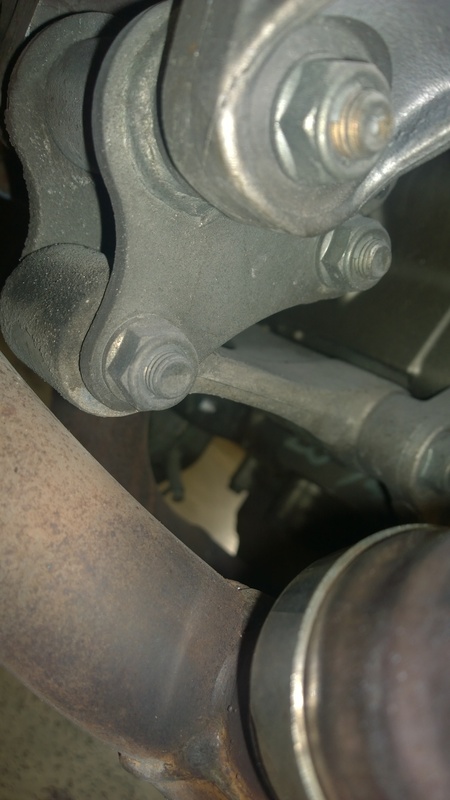 For more ride height you are better off slipping a shim between the top clevis and the frame. I have one that is 1/4". 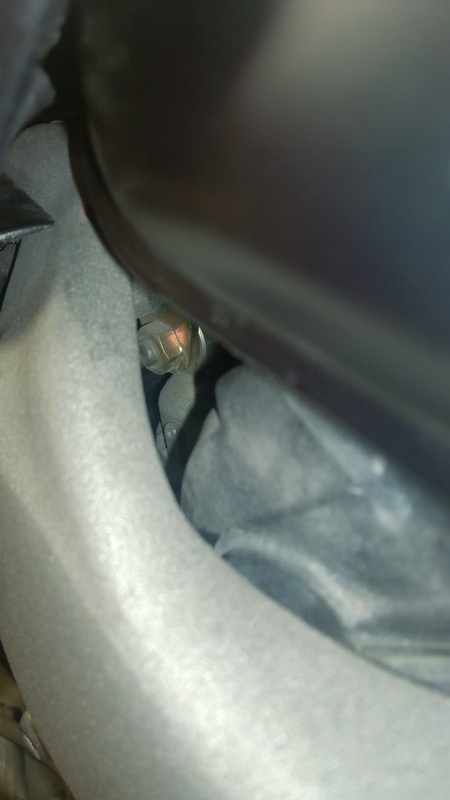 To install you need to loosen the top nut which is at the back of the tank through the frame, then lift the back of the bike up (I use some wood under the sidestand and a car jack under the exhaust joint on the right) so the clevis bolt drops down just enough to slip the shim in. Then drop the bike back on its wheels before tightening the top nut. One side effect of this is that your sidestand will now be too short and the bike may lean over further than you'd like. A 2004-6 CBR1000 sidestand bolts right in to sort that. By the way, as far as I can tell your rear suspension looks all stock to me. Wow, I've never seen forks slid that far down before. I'm surprised that there's not contact between the sliders and the lower triple clamp (or the mudguard and horn) when they're fully compressed. IIRC most people would slide them no further than about 10mm. On mine I don't bother, I feel the shimmed shock changes the geometry enough as it is. I also see the preload adjusters are screwed right in on the forks, probably to stop them bottoming on the original weedy springs (or to stop hard parts making contact when braking hard?). If you're keen, you can get a much improved ride by replacing the springs and then swapping in some new compression valves. IMO this is the best change that you could make after the shock shim. Shimming the rear shock makes much more than just the 6mm shim difference to the ride height, due to the leverage effect of the linkage. I would try that out first before changing much else. Definitely at least reset the front end to stock. That is NOT the correct way to lower a front end. The correct way is to do it entirely in the top-out spring area, so the forks cannot completely return to their fully extended position. 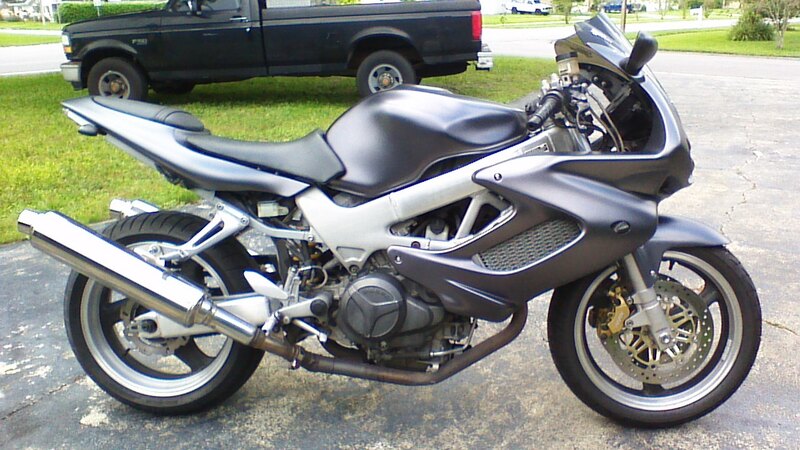 What I'm trying to figure out is how the person I got the bike from stated that he initially got the VTR because of his 6'4 stature and how the bike didn't make him feel cramped while riding. Those numbers don't equate: a person 6'4" with a bike that's been lowered to that height. Shims are on the way... woo hoo!